Three remaining homes on the southeast corner of First and Atwood streets will be purchased by the city and a developer as part of a planned riverfront development in downtown Shakopee. Gaughan Companies plans a five-story, 125-unit apartment complex and restaurant along the Minnesota River, and city officials have been working with the developer to purchase three holdout houses on the block targeted for redevelopment. The developer is working on a redesign to include the adjoining properties, add units to the development and increase its investment by as much as $10 million. Construction is set to begin this fall. “I think this is a better solution in the long run,” Kerski said. The Shakopee Economic Development Authority (which is comprised of the city council) voted Tuesday night to buy one of the houses and the developer is arranging financing to buy the other two, which will increase the developer’s design costs by about a half million dollars, Kerski said. 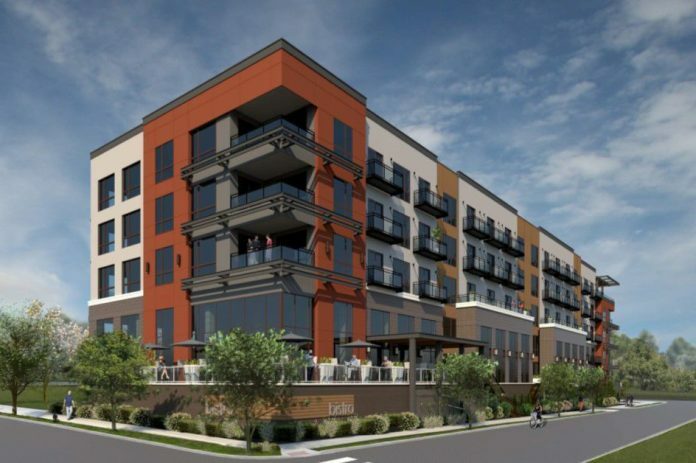 Since $2.8 million in tax increment financing was being used to help finance the project, the TIF district will be amended to include the three properties. The additional $10 million investment will generate about $900,000 in additional TIF, of which the city will take about $300,000 but “we will get our money back at 4%,” Kerski said. The Shakopee City Council previously approved an $800,000 loan to buy property for the development, conduct testing and fund administration costs. The EDA voted 4-1 Tuesday to increase the loan by $300,000 to cover the cost of buying the homes, plus administration costs. The loan would continue to carry a 4% interest rate and be repaid with TIF proceeds. The money will come from the EDA and be transferred to the city’s general fund. Voted 4-1 to approve a purchase contract for 313 First Ave. W., which was owner-occupied and rented recently until the tenant was asked to leave after a “gun incident,” according to city documents. The owner had planned to retire in the house, but decided to sell. The house appraised at $212,000 and the city will pay $13,000 in relocation costs. The EDA will fund the purchase and be reimbursed out of TIF proceeds. Voted 4-1 to approve a purchase contract for 116 Atwood Street N. for $200,000 — $175,000 for the property and $25,000 in relocation costs. The contract would be transferred to the developer, who would fund the closing on the property. Voted 4-1 to approve a purchase contract for 303 First Ave. W. for $250,000, plus $25,000 in relocation expenses. The redevelopment of the site would be reimbursed through TIF. The EDA also amended the effective dates in an April 2018 loan agreement with Doggie Doos Spa & Retreat to add a $12,000 incentive if the kennel/groomer relocates by the end of August. The EDA is buying over two acres in the Gateway West district to relocate Doggie Doos out of the River Bluff Redevelopment area on First Avenue. Part of the deal included a forgivable five-year loan agreement for $73,000 to help the kennel buy new equipment for their new facility. Since then, Doggie Doos has been unable to relocate after going through a number of contractors and having its loan delayed due to rising prices, interest rates and the federal government shutdown, according to city documents. The development costs are now nearly $2 million, about $400,000 higher than originally estimated. The lease with Doggie Doos ended last September and since then they’ve been paying rent on a month-to-month basis. The $12,000 incentive is basically the last three months of rent for free. City officials didn’t plan to own the property this long. “We never really planned to be in the landlord business,” Kerski said. “It’s basically holding up the entire project” because Gaughan doesn’t want to be blasting through bedrock next door to a kennel. The council also voted to apply for a Met Council grant to remediate site contamination in the redevelopment area, where a chunk of bedrock and a “vaste and deep” trash pit was discovered under the lot, ranging from nine to 19 feet deep. As part of the environmental research on the site, the city retained WSB and Terracon to do soil analysis, which turned up a large plume of volatile organic compounds and chemicals associated with a former dry cleaner in the area. VOCs are emitted as gases from certain solids or liquids and include a variety of chemicals, some of which may have short- and long-term adverse health effects, according to the EPA. Terracon is filing a voluntary cleanup plan with the state on behalf of the EDA and the developer.